A void marriage is a marriage which is unlawful or invalid under the laws of the jurisdiction where it is entered. A void marriage is "one that is void and invalid from its beginning. It is as though the marriage never existed and it requires no formality to terminate." A voidable marriage is a marriage which can be canceled at the option of one of the parties. 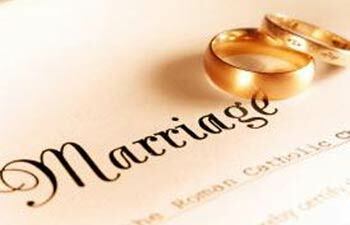 The marriage is valid but is subject to cancellation if contested in court by one of the parties to the marriage. The validity of a voidable marriage can only be made by one of the parties to the marriage; thus, a voidable marriage cannot be annulled after the death of one of the parties. A voidable marriage exists until it has been annulled by the courts. In a void marriage, the parties do not acquire any status of husband and wife as such it does not confer any mutual rights and obligations upon the parties. On the other hand, in a voidable marriage the parties acquire status of husband and wife and it confers mutual rights and obligations upon the parties for all purposes until a decree of court annuls it. In a void marriage, either of the parties to the marriage may marry again without getting a decree declaring the marriage void. The offence of bigamy is not attracted. On the other hand, as the voidable marriage is valid unless avoided, neither of the parties can marry again without obtaining a decree of nullity of marriage or else the offence of bigamy is attracted. In void marriage, neither of the parties acquire right of inheritance on the death of other party when succession opens. On the other hand, in case of voidable marriage, either of the parties acquire right of inheritance on the death of other party when succession opens, if the marriage is not annulled.